Although Emotional Traffic may have become notorious for its pointlessly delayed release (the album was completed in late 2010), don’t let that distract from nor diminish the disc’s ample amount of sublime merits. Anyone who’s followed the music scene for any amount of time knows record company politics are nothing new. 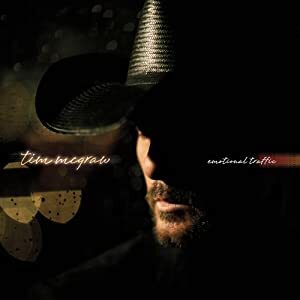 McGraw’s latest and final studio album for Curb is an impressive offering, which sounds decidedly determined to end the country artist’s 20-year relationship with his long-time label on a resounding high note. After much suspense and skepticism, Emotional Traffic has finally landed, and the result is a stellar collection of high caliber tunes contributed by such heavyweights as Angie Aparo, Rhett Akins, and Rivers Rutherford. The album’s highlights include a surprising, but instantly likable Ne-Yo duet “Only Human,” a notable cameo by McGraw’s country superstar wife Faith Hill (who provides a superb harmony vocal on the bouncy “One Part, Two Part”), as well as the stunning “I Will Not Fall Down,” which was co-written by McGraw himself, along with Martina McBride and The Warren Brothers. While McGraw has never been known primarily for his vocal abilities, he shows ample skill and disparity here. Besides, when has vocal ability been considered a mandatory criterion for male country stars? Vociferously, he runs the emotional gambit and uses the necessary inflection and attitude appropriate for whatever persona the songs require. He’s sultry on “Halo,” delightfully playful on “The One,” and hypnotically somber on the closer “Die By My Own Hand.” His ability to let it rip and restrain himself when necessary clearly demonstrates how much he’s grown as a vocalist over his-long term career. This is most obvious on “The One That Got Away,” which McGraw didn’t write himself, but nevertheless sounds remarkably autobiographical (“Everybody wants a piece of you/Everybody wants to be a star just like you are/Everybody wants to see you/Everybody wants to be you too”), despite being told from a female perspective. For those thinking this is simply a sub-par effort to satisfy contractual obligations, think again. Emotional Traffic contains all the essential musical ingredients an idyllic country blockbuster requires: remarkable songwriting, moving ballads and a smattering of top notch toe-tappers. All 12 tracks included here are easily strong enough to stand on their own. There’s not a clinker to be found anywhere throughout the disc’s 52-minute duration. From the brooding lead-off track “Halo” (co-authored by Music City’s heavyweight songsmith Luke Laird and Australian country artist Jedd Hughes), to the feel good playfulness of last year’s number one hit “Felt Good On My Lips,” and current single “Better Than I Used To Be,” Emotional Traffic is McGraw’s best and most accessible album, which could easily end up becoming the superlative album of his career. I really love tim mcgraw because his music is very emotional.